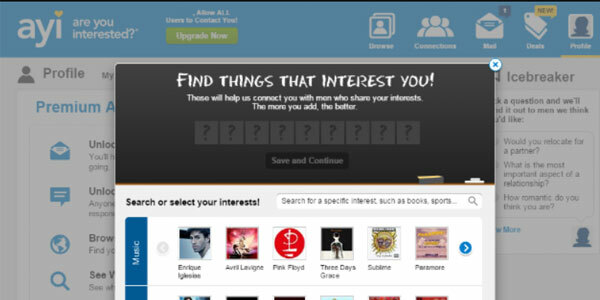 AreYouInterested.com takes a smart approach when it comes to connecting singles, finding you dates through mutual friends or shared interests. The site prides itself on over 70 million registrations, of which 20 million are connected through Facebook, and the way it’s designed to be fun and easy for singles to find new dates. 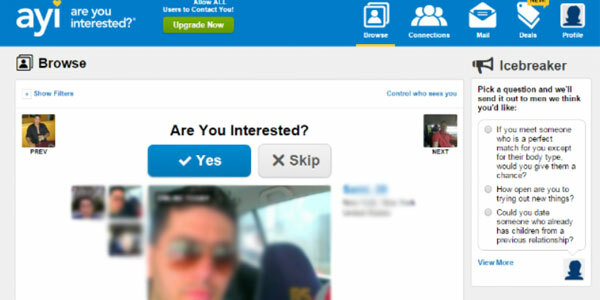 The site has an impressive array of features to help you with your search for a date. Because it is available as either a desktop of mobile version - with Android and iOS apps - you can connect and meet new people anywhere. Upon signing in, the first page you see is ‘Browse’ where you're presented with a potential date together with their picture and asked the question: “Are you interested?” You then have the option to click click yes and start communicating with them. The icebreaker questions in the right hand column are a nice touch. Here you can select one of the suggested questions and they’ll send it out to people they think you’d like. You’ll also receive icebreaker questions from other members. If you're interested you can reply by selecting one of the multiple choice answers. Otherwise, simply delete the message. If you're undecided, there’s an option to answer later. The paid membership option also offers you even more benefits including: find friends of friends and people with shared interests for better dates and more matches, unlock and read all your messages and mail, receive three times more messages, advanced search, see who viewed your profile, prioritized customer service, more filters for who can contact you. Browse people anywhere in the world. Signing up to AreYouInterested.com is quick and easy. The fastest way to connect is via your Facebook account. Otherwise you can use an email address, in three simple steps. You'll first be asked to state your gender and which gender you’re seeking to meet. To give your zip code or city and country. Your zip code is required to match you up with dates close by, but that information won't be made publicly available. A second screen confirms that information back to you, then asks for a first name, email, password and birthday. Finally, you'll be prompted to upload a photo either from your computer or facebook, as without one, you won’t be visible. There's no pressure for you to complete your profile, and AYI.com will let you browse at your leisure until you're ready to do so. Probably one of the most important sections to complete is things that interest you, so as to find potential dates who share them with you. Use the graphical images to choose up to nine interests and if you don't see what you're looking for, you can search for something specific. You can also write a paragraph about you and fill out other relevant information that covers aspects such as physical appearance, education, politics and religion. AYI.com provides some comprehensive safety tips for dating including warnings about typical scams and how to avoid them. As well as sound advice when meeting someone new for the first time. Although AreYouInterested doesn’t conduct background checks on new members, they do care about the safety and security of members. So if you notice any suspicious activity or someone makes you feel uneasy, you can click the “Report User” button for them to take immediate action. Since the free account on really only gives you the option to browse; when someone who catches your eye, you'll want to upgrade in order to communicate with them. AreYouInterested.com offers three different account plans. The minimum sign up is one month at $24.99. For three months it works out at $16.99 - saving you 33% a month. Or if you sign up for six months it's the equivalent of $12.50 a month. That's a saving of 50% compared with the monthly plan. 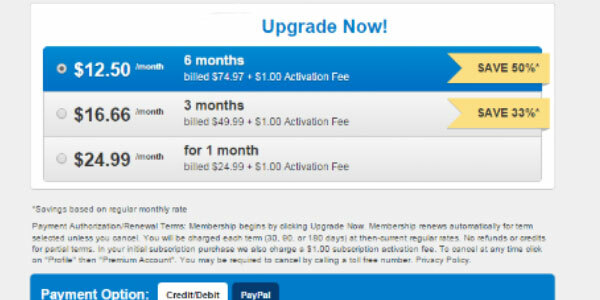 In addition you'll need to pay a one off activation fee of $1 for which ever plan you select. AYI.com has been designed with a clean interface, with useful features that is easy to use without ever becoming overwhelming. Five options in the navigation bar menu clearly give you all the features you need for searching for and communicating with your dates. The Frequently Asked Questions section is particularly useful. Here you can use the search bar or read through the comprehensive list of articles that should give you information on everything you need to know to navigate the site. However, if that still doesn't help you, use the Contact Us tag to the right and send your question as a message for further assistance. To make it easier for you to narrow down your search for a suitable date on AYI.com, there’s a filter where you can specify the geographic location in distance from you, age range and ethnicity of people you’d like to meet. In addition you can control who sees you, specifying by geographical distance and age range. Once you sign up for the paid account, there are even more search options available to select. Since AreYouInterested.com has one of the largest memberships of any online dating site, there’s a good chance you'll find a date here. Especially with their methods of matching you up with friends of friends or people with shared interests. However, if the suggested matches still don't meet your criteria, you might like to read our review of EliteSingles.com.